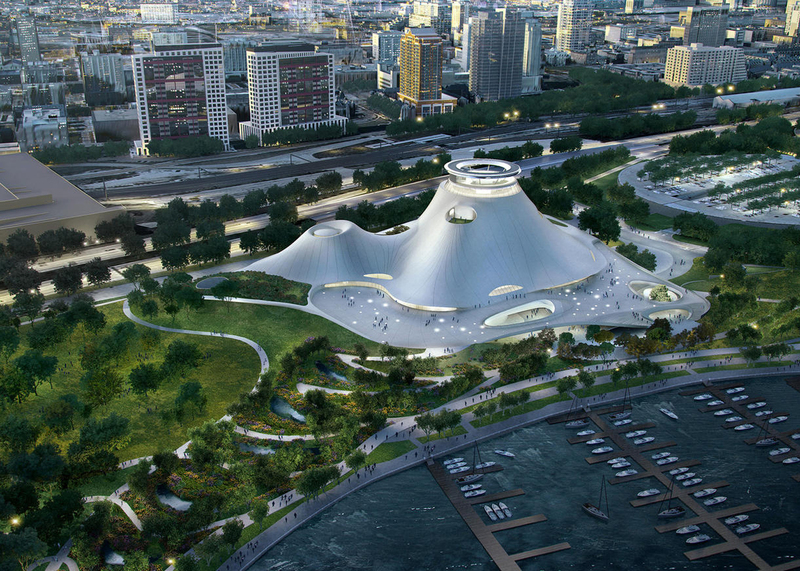 Filmmaker George Lucas has confirmed that he is pulling his MAD-designed museum from Chicago and plans to move the proposal to America's West Coast. The Star Wars creator announced last week that he is ending his bid to build the Lucas Museum of Narrative Art on a lakefront car park in the Illinois city, after an ongoing lawsuit attempting to block the building. The injunction has threatened the project since it was filed in November 2014 by organisation Friends of the Parks, which argues that the museum is a private development on public land and would spoil the area. "No one benefits from continuing their seemingly unending litigation to protect a parking lot," Lucas said in a statement. "The actions initiated by Friends of Parks and their recent attempts to extract concessions from the city have effectively overridden approvals received from numerous democratically elected bodies of government." Lucas appointed Beijing architecture studio MAD and local firm Studio Gang to work on the design of the museum, which would display his personal art collection. Plans for the 300,000-square-foot (27,870 square metres) building to be constructed south of Soldier Field were approved by the City Council in October 2015, after MAD scaled down its initial plans. But Friends of the Parks continued with legal proceedings, despite architect Frank Gehry's defence of the design. The news to withdraw the project from Chicago comes after the city's mayor Rahm Emanuel suggested an alternative location for the museum. In April 2016, he proposed demolishing the unloved McCormick Place Lakeside Center and building the museum in its place. Reports earlier this month stated that Friends of the Parks was willing to back the revised plan, but then changed its mind. Regardless, the deadline for negotiations was last week. "It is unfortunate that the Lucas Museum has made the decision to leave Chicago rather than locate the museum on one of several alternative sites that is not on Chicago's lakefront. That would have been the true win-win," said a joint statement from Friends of the Parks executive director Juanita Irizarry and board chair Lauren Moltz. "Unfortunately, time has run out, and the moment we've consistently warned about has arrived," said Emanuel. "Chicago's loss will be another city's gain." "We tried to find common ground to resolve the lawsuit — the sole barrier preventing the start of the museum's construction," he continued. "But despite our best efforts to negotiate a common solution that would keep this tremendous cultural and economic asset in Chicago, Friends of the Parks chose to instead negotiate with themselves while Lucas negotiated with cities on the West Coast." Lucas is now searching for sites in California, including San Francisco and Los Angeles, where mayor Eric Garcetti has already endorsed the potential move. "The Lucas Museum of Narrative Art would be perfect for Los Angeles," Garcetti said in a statement. "Tens of millions of people visit our city every year — and LA has unquestioned stature as a world arts capital, thanks to institutions like the Broad, the Getty, MOCA and LACMA." "We would welcome the opportunity to be a permanent home for this incredible collection, which would become part of a museum culture that is unrivalled in the United States," he added.